In May of 2014, I learned that Donald Kirkpatrick passed away. 1. Smile sheets don’t justify a giant ego (if the feedback is good) nor are they the end of the world (if they’re bad). I first landed a job with “training” in its title about 8 years ago, and the way by which I measured my work was by the end-of-training evaluation forms. I viewed them as my report card. Great evaluation scores would have me walking on top of the world for the rest of the afternoon. Poor scores were absolutely devastating. I don’t remember where I first heard of Kirkpatrick’s 4 levels of training evaluation – perhaps on an ASTD discussion board, perhaps in T+D magazine. When I learned that post-training evaluation scores were the bottom rung of training evaluation, I felt liberated… until I realized that I had to actually be intentional on how to ensure people learned something, that they could use new skills on the job, that they could improve their performance in a measurable way. It was a completely different outlook on how to approach my work. A new and exciting challenge that wasn’t limited to the whims of post-training smile sheets. 2. Training should actually be transferred. Kirkpatrick’s 3rd level, “transfer”, had perhaps the most profound impact on my work. It’s a level that I, and I’m sure many of my colleagues (yes, even you, dear reader) continue to struggle with and do poorly. Afterall, once people leave the training room, what control do we have over whether or how they choose to apply our brilliant lessons and content on their job? It’s the simple act of being consciously aware that transfer of learning to the job is the Holy Grail of training design and evaluation that transforms training sessions from being presenter-centered to learner-centered. And while it’s extremely difficult to measure transfer, top-notch trainers will always strive to achieve efficacy at this level. 3. Bottom line: it’s a process, not an event. The first two items above naturally lead to this point: if training is about more than high evaluation scores, if training is about transfer to the job and the subsequent results that transfer can yield, then training must be a process, not a 1-hour or 1-day or 1-week event. Aiming for the highest levels of the Kirkpatrick evaluation model has inspired me to figure out what kinds of job aids might live beyond the training room, what kinds of communication with supervisors is necessary in an attempt to forge partnerships with those who will have more influence on whether learning is transferred on the job, and what kinds of longer-term evaluation instruments need to be integrated into the training’s design. We spend more waking hours at work than we do with our families. When we learn how to be better at work, it can improve our quality of life. These three lessons made me a better training professional, and in turn, improved my quality of life. Though he’s no longer with us physically, I believe his legacy will continue to transform training programs for generations to come. Thank you, Donald Kirkpatrick, for sharing your talents and your work. Who are your influences? 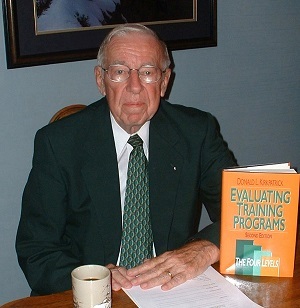 Did the Kirkpatrick evaluation model influence you? How has your understanding grown?